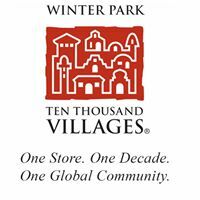 While many things have changed since Ten Thousand Villages Winter Park first opened in 2006, one thing remains constant – as a fair trade pioneer, we believe market-based solutions can end the cycle of poverty. We are not your typical business. We are a non-profit social enterprise that partners with independent small-scale artisan groups, co-ops and workshops. 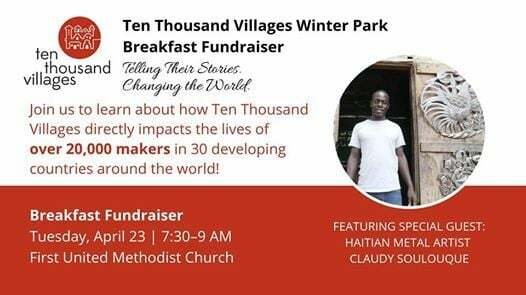 Join us for Telling Their Stories, Changing the World: a Fundraising Breakfast, as we celebrate our 13th year and look forward to a future where all artisans in developing countries will earn a fair wage, be treated with dignity and respect and be able to live a life of quality. This year, we are thrilled to welcome a special guest: Haitian metal artist Claudy Soulouque will be joining us to share his story and talk about his 30 years of experience in metalworking. Learn more about his life and the beautiful metal artwork he creates, which he is able to sell to customers around the world with Ten Thousand Villages. 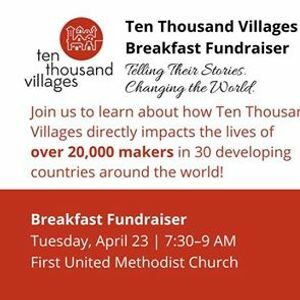 The breakfast fundraiser is free to attend, but we are counting on your donation to help support our non-profit organization and mission. Come enjoy a complimentary breakfast, with a program to follow. You will hear the stories of our artisan partners and our founders, and learn how fair trade is making a local and a global impact. Together, we can make a positive change in the world. Join our movement. Be part of our story.